Slightly shorter options of this tour may be requested and costed but requests MUST be made as soon as possible (well before closure date) and will depend on several factors. **Early deposit is necessary in order to secure flights and performance tickets. 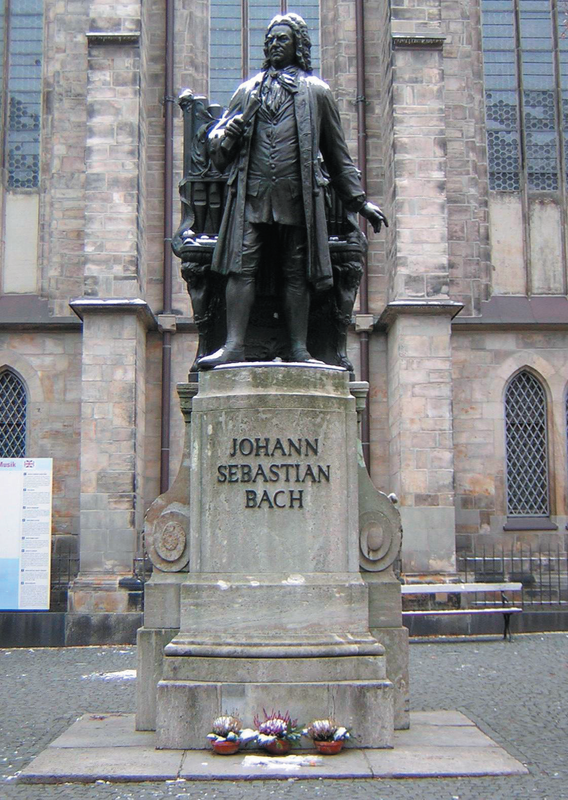 We commence our unique tour in LEIPZIG with inclusions of the famous LEIPZIG BACHFEST and excursions to locations associated with JS Bach and his prolific family. Leipzig (Leipzig/Halle Airport) is easily reached direct from Vienna, or from Frankfurt or Berlin on Lufthansa and then by fast train. (Our Leipzig hotel is minutes from Leipzig Bahnhof, the largest and most modern rail station in Europe). Many other airlines (inc Qantas/ Emirates) can get you to Leipzig. Highlights of our Leipzig stay will include performances by the famous St Thomas Choir in the equally famous Bach’s Thomanerkirche, a wonderful performance of Haydn’s ‘Creation’ in the great Gewandhaus by the great Gewandaus Orchestra and Choir, and an exciting and different ‘Passion’ in one of the most exquisite churches in Europe ... the Nikolaikirche, conducted by the illustrious CHRISTOPHER HOGWOOD. We also have a most extraordinary gift, a private performance in the salon of Mendelssohn’s home, by a piano trio made up of members of the Gewandhaus Orchestra! A rare privilege indeed. There will be much more of interest arranged in Leipzig, ‘City of Music’. After Leipzig we spend a couple of days in nearby beautiful WEIMAR, again tracing Bach’s involvements there, as well as those of Franz Liszt and savouring the utter delight of this picturesque town, which Goethe famously described as being his “Little Paris on the Ilm”. A full day spent with our long trusted and marvellous guide in BAYREUTH, a most beautiful small city associated mostly with Richard and Cosima Wagner and also Franz Liszt will eventuate before we settle for three nights in magnificent DRESDEN. Yes, you will see an opera at the famous Semper Opera House, a performance by the equally famous Dresden Staatskapelle, visit the incredible Zwinger Museum and the beautiful and moving Frauenkirche, which was rebuilt, numbered stone by numbered stone, after it’s almost complete destruction by the Allies in WW2. And much more. We will also be staying here in the iconic Hotel Bellevue on the banks of the River Elbe, always the Dresden choice of the late Yehudi Menuhin. After all our journeys by private coach a change of experience will have us taking a first class train ride of 2½ hours from Dresden to PRAGUE and all that city, (sometimes referred to as the ‘Conservatoire of Europe’) reveals. Our historic hotel right in the Old Town Square will enable a lot here. So many people have already visited Prague that we have decided to spend only two days here, but they will be packed ones. Following Prague, our driver will take us on an extremely beautiful journey to SALZBURG for four days, and on the way, we will spend a little time and have lunch in Cesky Krumlov, claimed by many to be the most picturesque small town in Europe. ANGELA HEWITT’s highly acclaimed TRASIMENO FESTIVAL in medieval locations around the serene lake of the same name, which is where Angela has made her Italian home. It is the tenth anniversary of this diverse and wonderful festival and we are already safely ‘booked in’! The full program will be released by November, but I can promise you that, as always, it will be a remarkable one with many important international artists, banquets, excursions ... we will have it all. Our tour finishes on the afternoon of July 7th, when we will return to ROME, from where you may continue your travels, return to Australia OR spend a few days in the Eternal City. NB: This is a fairly long tour. Because some participants may not be able to manage it all, for the first time, I am offering in addition, a couple of possible options. THE FULL TOUR: June 18th – July 7th (20 days /19 nights). Request for shorter option may be made ahead and could be arranged and costed depending on numbers requesting such. 16.30 hrs: Join Roma Randles, her Associate and other tour members at our first Tour Meeting in hotel. 18.00 hrs: First two courses of Welcome Dinner before walking short distance to ST THOMAS CHURCH for our first BACHFEST concert: The Thomaner Choir with Gewandhaus musicians, conducted by Thomas Kantor, Georg Christopher Biller. Program will include Baroque treasures from JS Bach, Telemann, Brautigam. Dessert and coffee back at hotel. Our driver will collect us for a visit to the famous Leipzig Conservatory founded by Mendelssohn where so many revered musicians and composers studied. We visit the home of Robert and Clara Schumann, followed by a guided tour of the Mendelssohn House. Here a superb surprise awaits in the salon ... a very special private performance for us by a Piano Trio from the Gewandaus Orchestra who will play Mendelssohn’s beautiful Piano Trio Op. 66 just for us! What a treat. We have lunch at the Paulaner Palais restaurant and visit some other Leipzig highlights before the rest of your day and evening are your own. (Many printed suggestions and assistance). There is so much going on during Bachfest week. The decisions will be yours. Today a most interesting excursion to JS Bach’s roots, and the story of his illustrious family in EISENACH, and other associated locations. This day will also include the impressive Wartburg Castle towering above EISENACH, where Martin Luther hid out as a wanted man for his Reformation ideas and used his time working on a refined language, which is actually the German spoken today. Lunch in a pretty inn. 20.00hrs: A concert in the great Gewandhaus, which claims the best acoustic in Europe! Gewandhaus Orchestra, Choir and Soloists. Your afternoon will be free for rest or more discovery ... so much still to experience in Leipzig! 20.00hrs: NIKOLAIKIRCHE – One of the most beautiful church interiors in the world. (Apart from all its connections with Bach, you will already have discovered its role and that of the courageous maestro, Kurt Masur, in the Fall of the Berlin Wall in 1989). the highly acclaimed CHRISTOPHER HOGWOOD. A moving and glorious work to end our time in this City of Music. of the nineteenth and twentieth centuries, especially the early Romantics. Hogwood has been associated with most of the great orchestras of the world. We are so fortunate to experience his direction in the beautiful Nikolaikirche in Leipzig 2014.
verdant park by the River Ilm a very special place for reflection. Goethe called Weimar “My little Paris on the Ilm”. Our home for two nights in Weimar will be the elegant HOTEL RUSSISCHERHOF. You will be escorted on two in-depth explorations of this historic and very pretty little city by our charming and very knowledgeable guide, Dr Dieter Rudolph. Two meals in historic venues, a concert on the organ actually played by Bach, as well as, hopefully, a major concert in the magnificent Weimar Concert Hall. (Too soon for details of the latter). 08.00 hrs: We set off for a full day in the very beautiful and interesting small city of BAYREUTH ... most famous of course in modern times for Wagner’s Bayreuth Festival, to which the glitterati from round the world flock and scramble for incredibly expensive tickets in the strangely interesting but cold and functional Festspielhaus he had built himself and which is only used for such a short time each year. The incredibly extravagant home of Richard and Cosima Wagner, ‘Wahnfried’ is open again after extensive renovation, and one must remember that Wagner had very extravagant tastes but no money so always the music-loving young King Ludwig had to be persuaded! The truly beautiful UNESCO listed Margrave Opera House, the special house / museum where poor Franz Liszt, (Cosima’s father) died, the history, the many lovely squares, parks and burial grounds and so much more. All will be revealed by our warm and delightful guide, Mrs Ludwig, and lunch in a special rustic inn is always a highlight of our many visits to Bayreuth. 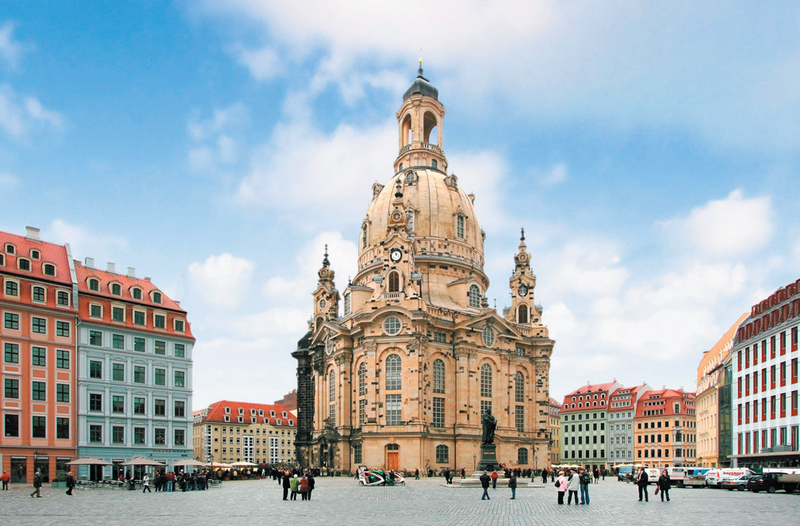 In the late afternoon we travel on to the great city of DRESDEN, where we will spend three nights. On arrival at our hotel, we bid farewell to our trusty driver, who will return to Leipzig. Our hotel in Dresden will be the luxurious HOTEL BELLEVUE in its prime location set in magnificent gardens on the River Elbe. (Incidentally, it was always the hotel favoured by the late Yehudi Menuhin when performing in Dresden and environs). in which this very special church was rebuilt, numbered stone by numbered stone, after the allied fire storm of WW2 which heartbreakingly destroyed the city. It is always a very moving and thought-provoking experience. Quite alot of free time has been built into this stay in Dresden because it is such a very extensive and interesting city. You will receive much in the way of printed information and suggestions. Performances in Dresden will include the Rossini opera 'Barber of Seville' in the famous Semperoper, and a performance by the Dresden Staatskapelle.
. (More detailed information later on). hotel in Prague is the Best Western Hotel Meteor Plaza, situated right in Old Town Square, where everything is accessible on foot. So much will be offered. And the programme will commence with a very inclusive over-view tour of this city which has shed its politically stifled past and is brimming with life. It is also brimming with music and there are concerts galore. Too soon for details, but you will attend an opera at the magnificent State Opera, and much more this city has to offer its visitors. A lovely scenic journey today with a new driver. We are heading from Prague to SALZBURG, a journey of about four and a half hours. But we have decided to take the opportunity to stop off en route for a wander and lunch in the UNESCO - listed special colourful little spa town of CESKY KRUMLOV ... considered by many to be the prettiest small town in Europe. SALZBURG! What is there left to say about this gorgeous city associated so much with Mozart (though many do not realise he ended up by hating the place and escaped to Vienna!). 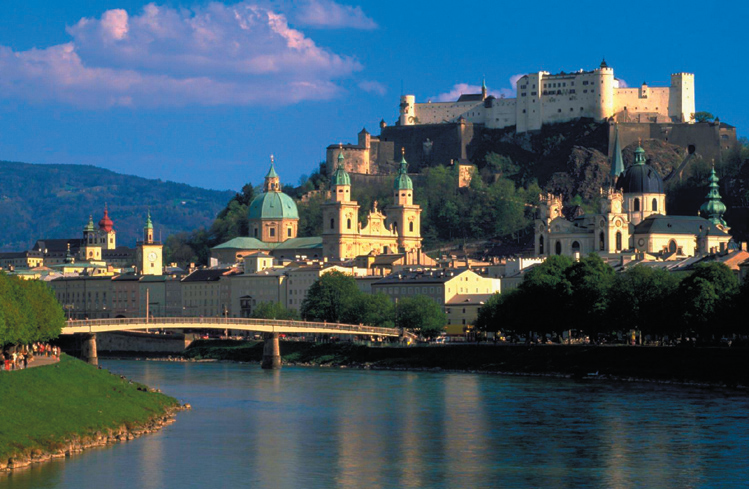 Well that is a story in itself; but it does not negate the undeniable beauty and charm of wonderful Salzburg, where the annual Salzburg Festival every August has been a drawcard for music lovers for years, despite now the truly outrageous price of tickets. A walled old city centre across the River Salzach and overlooked by a towering castle fortress, it is a truly beautiful place. There are many links with Mozart here but that is only part of the story. The great Mozarteum is a major academy of advanced musical education and performance. And the region of the nearby Salzkammergut, with its mountains and lakes is a must excursion, which of course will be included. Our home in Salzburg for four nights will be the first class HOTEL BRISTOL right on the river and very conveniently situated for walking. Our amusing and highly informed Tyrolean guide will bring the city and its history and magic places alive for you. Discovering Salzburg. With our guide and with Roma. An excursion to the delightful region of mountains and lakes which will include a short cruise by boat for lunch at the “White Horse Inn” of musical comedy fame. Note: Details of performances in Salzburg not yet available. You may expect two to be programmed in our schedule. dinner in Italy in the hotel restaurant. A morning excursion and afternoon opening of the TENTH TRASIMENO FESTIVAL. (2014 program will be available by November 2013) at the magnificent Basilica of ASSISI. 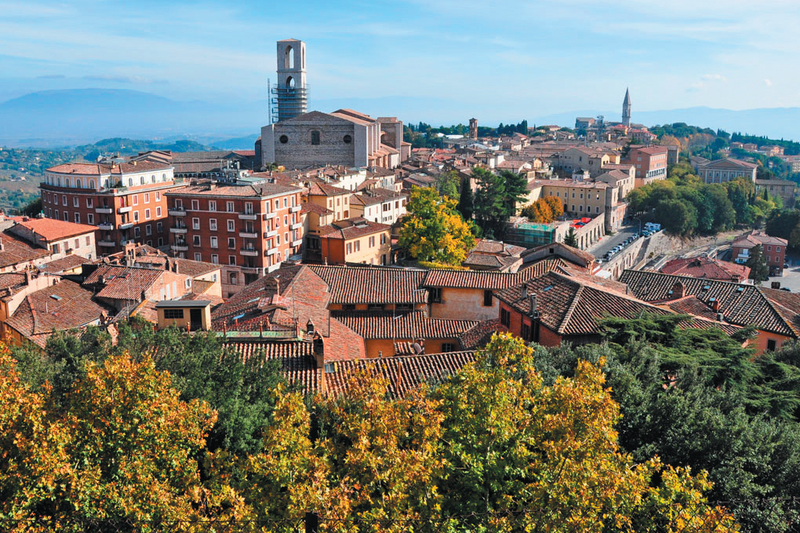 The university city of PERUGIA in the hilly country of North Umbria and close to the lovely lake of Trasimeno is where the internationally renowned concert pianist ANGELA HEWITT has made her Italian home and where she decided would be the perfect setting for a summer festival of music. Celebrating its tenth anniversary in 2014, this festival is recognised by classical music lovers across the globe as being the best of all the more intimate European festivals. Angela Hewitt is celebrated as one of the finest performing artists on the current world circuit. She has been honoured with the Order of Canada (OC) and created an Officer of the British Empire (OBE) in 2006. 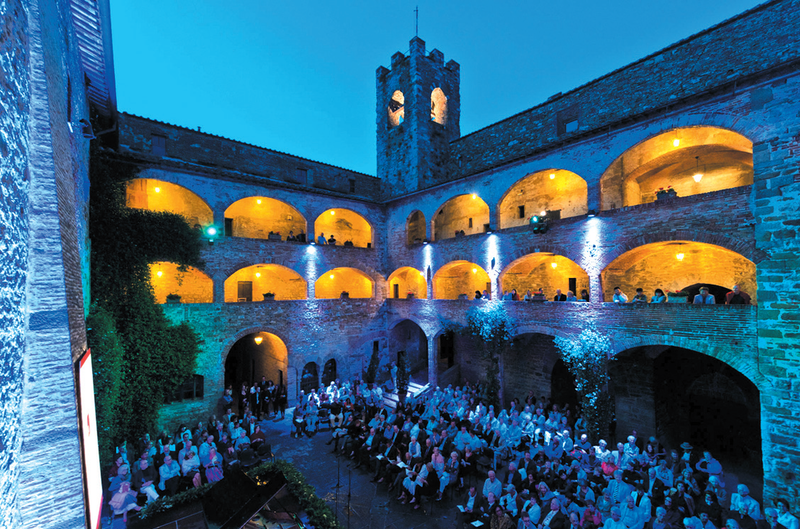 During this annual festival set in several wonderful medieval locations in Perugia, Gubbio and Magione, Angela Hewitt herself performs with many internationally famous artists and personalities. Lovely concerts, banquets, ‘happenings’ of all kinds will be ours to enjoy for the first three festival days before we journey back to Rome. Note: *If requested at time of booking, it would be possible to remain in Perugia till the end of the festival on July 9th. OFFICIALLY, THE LINGUA MUSICA TOUR 2014 IS OVER! Those who may wish to stay on till the end of the Trasimeno Festival may do so. We can assist with these arrangements ONLY if requested at time of booking. This festival is usually fully booked months ahead! FULL DAILY SCHEDULE AND ALL RELATED INFORMATION WILL BE CONTAINED IN OUR 2014 TOUR HANDBOOK WHICH ALL PARTICIPANTS RECEIVE BY TWO WEEKS BEFORE THEIR DEPARTURE FROM AUSTRALIA. 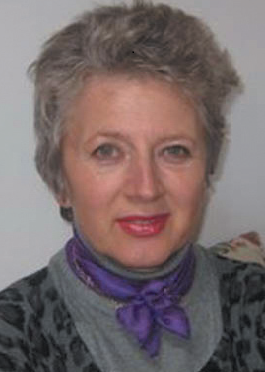 Living now in Castlemaine, Victoria, Katharina had experienced so much post WW2 family pain in Germany, but her time at the Sorbonne in Paris opened up the possibilities of an amazing future. Travelling the world exhibiting and speaking, she has painted and sold hundreds of huge, colourful, amusing but thought provoking canvases, which challenge women to realise their potential. Katharina is an excellent linguist and is now also honing her very considerable writing skills. the major keyboard works of J.S. Bach. Visit the Trasimeno Festival web site.